Sometimes I look at the bookshelf and wonder when Scott got into things like Elemental Differential Equations and Boundary Value Problems. I would ask, but he might tell me what differential equations and boundary problems are, and then the little mouse that is on the wheel in my tiny left brain might hyperventilate and die. So I was happy to learn that Scott started thinking about these issues during the winter of 1986, at the latest. He would have been 8 years old. We must leave aside, for a moment, the bewildering revelation that in 1986 our great nation asked the fourth grade to design a new war machine. It was the Cold War. We’re just going to let that one go. I am posting Scott’s essay below because it never got the praise it deserves. It is downright a propos today, which suggests he was ahead of his time. And if you want to know more about how it is literally possible to be ahead of your time, we appear to have a book called Gravitation and Space Time that I could lend you. He kind of got a check plus, but it’s not clear because the plus and the check are so far apart. And despite having infrared eyes, maximum running and jet pack speeds, and specific slimeball, creep and scum-sucker opponents, Rattlesnake was found lacking in detail. Modern-day Scott looked distressed when he saw this. After a while, I asked him whether he wanted to expand on any of his good ideas. I asked him what Rattlesnake would eat, for example, if he ate food. “Thorium-fission energon batteries,” Scott said. It shouldn’t come as a surprise to any of us that I don’t know how to make those. So I made Rattlesnake’s second favorite food, which is pumpkin cupcakes. I made lots of them because if Rattlesnake goes hypoglycemic on us, our democracy is totally screwed. These mini-cupcakes are adapted from this Bon Appetit recipe. We decorated them all Halloween-like for our friend Angie’s amazing Halloween party (where I ate delicious spinach-sausage-cheese dip, and club crackers wrapped in parmesean and bacon. 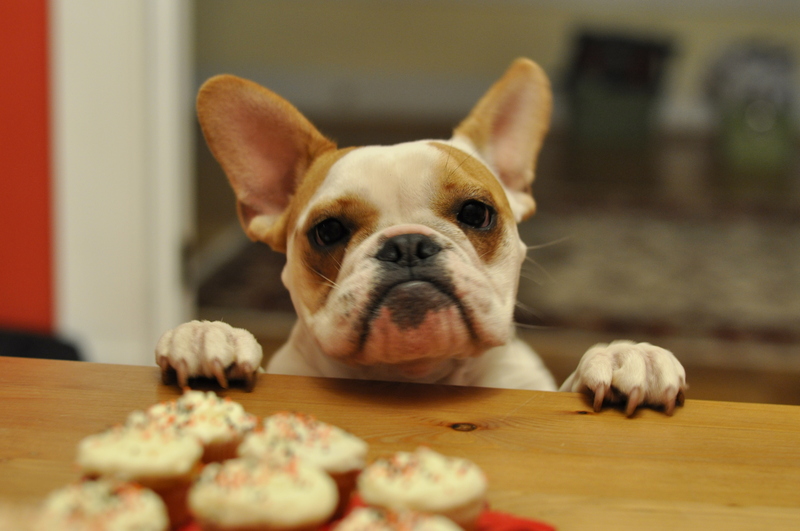 I know– who cares about the cupcakes anymore, right?) But if you change the sprinkle colors up, these cupcakes will be good party tokens through the winter holidays. I didn’t change much in the Bon Appetit recipe except to work around some of the things you might not have on hand, like self-rising flour and pumpkin pie spice mix. And I decreased the sugar in the icing, because cream cheese frosting is better when you can taste the cream cheese through all that powdered sugar. 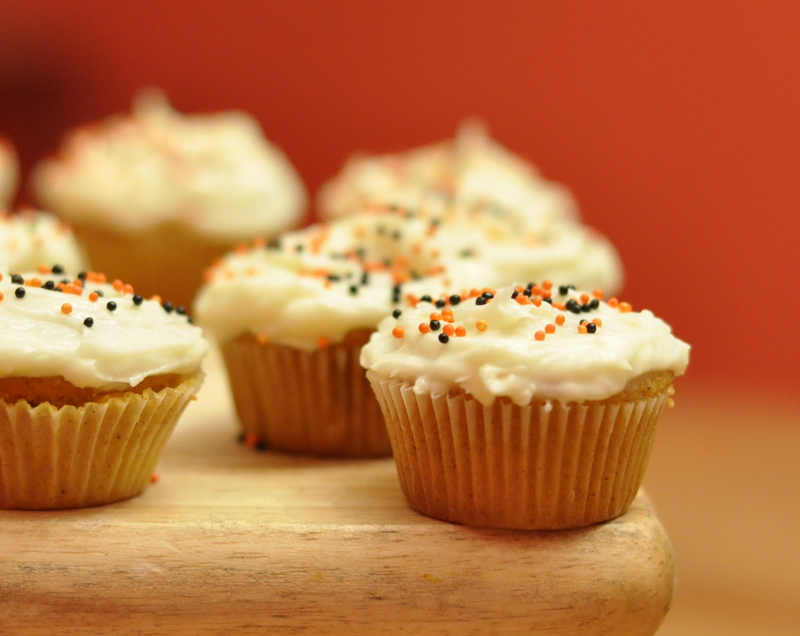 These cupcakes would also be awesome with the amaretto frosting here. In a bowl, combine the 1 c. flour, 2/3 c. packed brown sugar, the 1 1/4 tsp. baking powder, the 1/4 tsp.+ 1 pinch salt, and the spices (the 1 tsp. cinnamon, 1/4 tsp. allspice, 1/2 tsp. nutmeg and 1/2 tsp. ground ginger). In another bowl, whisk together the 1 egg, 1/3 c. oil, 1/3 c. sour cream, 1/2 c. pumpkin and 1 1/2 tsp. vanilla. Pour into mini muffin pans lined with cupcake liners. 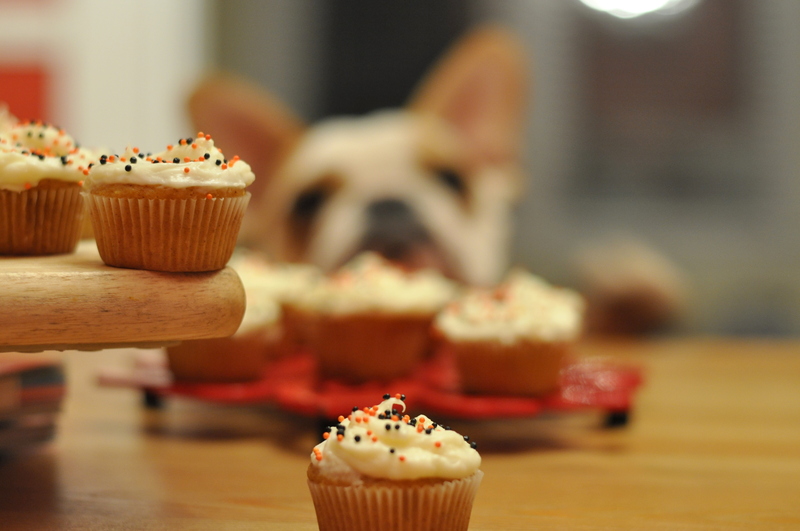 Bake 15-16 minutes, or until a toothpick jabbed into the center of a cupcake comes out clean. To prepare frosting, beat the 1 package cream cheese and the 1 stick butter in an electric mixer until smooth. Beat in the 1 tsp. vanilla and the 1 1/2 c. confectioners’ sugar. If are going to color the frosting, add the food coloring now. Obviously I need to send you the story about the atomic scissors as well. Yes PLEASE. Scott claims he can’t remember the details of the atomic scissor, but I don’t believe him because whenever it’s come up in the past day or two, he gets this crazy gleam in his eye. And please let’s not forget that Scott’s work on war persons was thoroughly appreciated by his mother, if only because she was so grateful that he was doing his homework. Clearly it was indeed much appreciated, as it arrived in mint condition in the best care package ever. I am so glad you saved it! I’m a college friend of Scott’s and once owned that same book. I was traumatized by its successor, “Elementary Applied Partial Differential Equations.” I determined that college-level textbooks with “Elementary” in their name are a bad thing. I’m a somewhat recent follower of your site and wanted to say “Hi” (really, I want to say, “Hey!” because I was raised in Georgia, but I’m afraid that might scare you so I’ll stick with the geographically neutral “hi”). I feel like I’m eavesdropping to read your site without introducing myself. I’m Courtney and I think I know Scott from being an RA. Hi! The cupcakes are delicious! I just ate two of them! You are so right about the icing not needing to be so sweet. I don’t normally like cream cheese frosting for that reason, but these were yum! Thanks for coming to the party. It was great fun and your costumes were terrific! We had a blast, Angie– I could say it a million times, but I have NEVER been to a party for any holiday that had decorations as cool as your Halloween party did. Thanks for having us! Oh my goodness, this post had me laughing. “War person”? Wow. “War person,” I know! I love how on the illustration of the “War person,” he drew an arrow and wrote “Jet pack,” just to be explicitly clear about how awesome his War person was. Miiight have just read this aloud to my husband. The teacher must have been hungover when she graded the essay. I would know because my sister is a 5th grade teacher, and she’s definitely more critical on “those” days. Ahhh your sister must have some good material! And that is a good call on the teacher’s hangover. It was December, after all. Maybe she was angry at herself for letting herself get a little out of hand at the faculty holiday party the night before? Wait. Isn’t the dog the star of this post? Look. At. That. Face. I bet that dog would totally eat scum-sucking crooks. A war person is one thing. A war person with DOG that could run up to mach 1? Even better. Also, I enjoy the part about mostly blowing things up. Why blow something up entirely? I am going to start saying this around the house now. I’m so glad I found this blog! HILARITY! 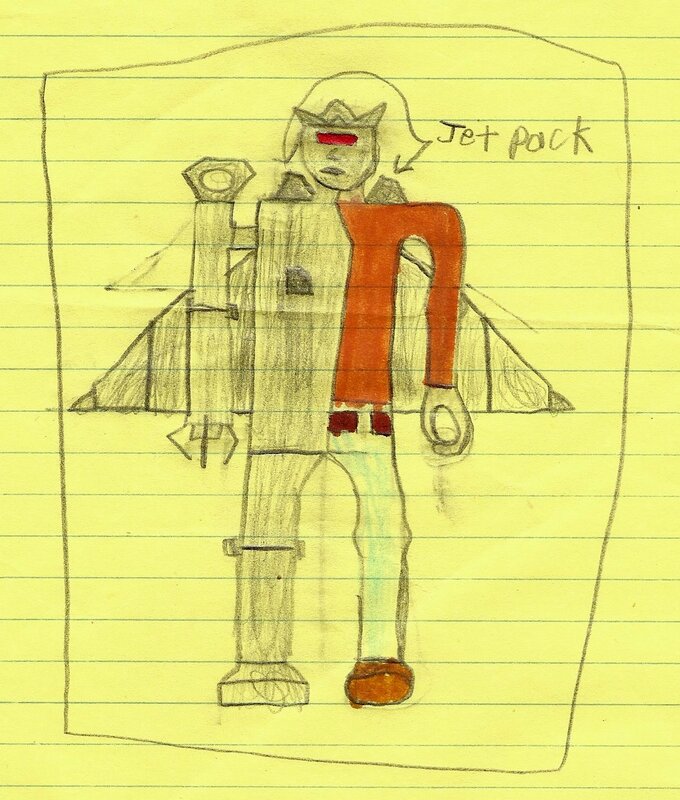 Also, wicked cool transformer drawing, 8 year old Scott! Props from the future (and 3 year old me). DramaDoc, that drawing still cracks me up. I love how he wrote “JET PACK” with an arrow, like he wanted to be really sure the teacher (who was probably like “what the…? !”) knew what it was. You’re awesome for reading, thank you! Rattlesnake sounds like a straight up badass. I bet he’d be into “Full Metal Jousting” an amazing-sounding new show that’s about to come on Discovery Channel. Rattlesnake also sounds like he’d help Thunder out with reaching one of those cupcakes.